In 1955, the name Taekwon-Do was chosen as the name of the national martial art by a board of instructors, historians and other prominent persons. The name was selected for its apt description of the art. Tae (foot), Kwon (fist), Do (art). Not only did this new name bear a close similarity to the ancient name TaeK Kyon, but also the name gave a new sense of nationalism to the art, whereas the prevalent name of Dang Soo connoted Chinese hand. 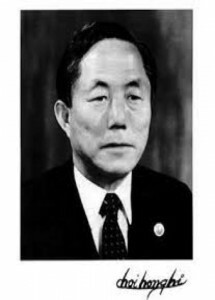 The years of research and development by General Choi resulted in the Chang Hun Style (open name of the author) of Taekwon-Do. Though this style is primarily based on Taekwon-Do. Though this style is primarily based on Taek Kyon, Soo Bak, and karate techniques, a myriad of techniques have been added, especially in the variety of hand techniques and perfection of foot techniques. The Chang Hum style is based on twenty-four patterns, each perfected and polished by General Choi Hong Hi and his colleagues, from the white belt pattern Chon-Ji, to the highest one, Tong II.